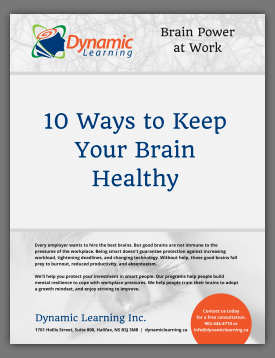 Anybody at work is well aware of the constant need to learn new information and new skills. But our ability to make that learning stick is held back by a number of office conditions and mythical beliefs. For instance, we are expected to learn even when our attention is constantly being disturbed by interruptions and distractions. It is a myth we carry from our school days that a lengthy, marathon study period is the best approach. And that acing the test is the main objective when, in fact, our ability to use and build on the new learning over days, weeks, and months is what is really important. Another office myth is that multitasking works. If you want to improve your learning ability, and that of your colleagues and family members, here is some valuable information from the NeuroLeadership Institute: a summary of what I have learned from their Journal article, The Science of Making Learning Stick: An Update to the AGES Model. The AGES Model, first introduced in 2010 and updated recently, stands for Attention, Generation, Emotion, and Spacing. Research studies repeatedly show you cannot remember much of anything you do not focus your attention on completely. That means, if you are listening to learn, don’t hear any other talking and don’t look at print (even on PowerPoint slides), and certainly don’t look at emails, text messages, or social media. The same restrictions apply if your learning involves reading, typing, or writing. You will learn much better and faster if you focus your attention exclusively on one activity at a time. This kind of attentive learning involves our pre-frontal cortex and our hippocampus, which work beautifully together so long as they are not interrupted. One excellent way to focus your attention is to take a pre-test of what you are about to learn to see what you already know and what will be new to you. Because using your full attention takes a lot of energy, you should have a short break to do another of the AGES steps every 20 minutes or so. Any one of those questions and the answers they generate for you would help embed your new learning. Perhaps the most valuable form of generation is insight – that eureka moment when the unconscious mind solves a problem. Insight is directly related to generation by connecting ideas in a way they have not been previously been connected. For example, due to an unfortunate experience with my first teacher of French, when I was 13 I decided that I could not learn French. Recently I have been studying the Growth Mindset vs. the Fixed Mindset, when I realized that I had a fixed mindset about learning a second language. Now I have signed up for a Learn to Speak French 10-week program. My goal each week will be to get better at speaking French than I was the week before. We learn better if we are somewhat emotionally aroused, preferably in a positive way, but even mild negative arousal can help. This is because our hippocampus, which embeds new memory, gets additional signals from our brain regions that respond to arousing stimuli. Obviously strong emotional arousal would be distracting but you can harness moderate emotional arousal to help with your learning. Another way is to regulate your level of emotional arousal by re-appraising your thinking. For example, rather than continuing to feel very anxious because you are thinking, “I will never be able to do this properly.” Remind yourself, “I have been able to learn pretty well anything I really work at. It might take a little longer but I know how to work hard.” You will notice yourself becoming just mildly anxious, enough to drive yourself to make an extra effort. Having some space (usually a day or more) between learning and review sessions is probably the most important of the four learning principles. Unfortunately, due to our school days where getting top marks in a test was more important than being able to demonstrate consistent retention of learning over time, we often believe that last-minute cramming – or marathon learning sessions – work best. Research consistently shows that spacing out our learning sessions is a far better choice. As our brains are constantly working to incorporate new learning into our long term memory, at least one night of sleep between learning sessions will do wonders to our retention. Memories are not like documents we keep in computer or file box. We don’t make them once and store them forever. Instead we integrate, grow, expand, and change our memories on a continuous basis depending on what is happening in our lives. During a learning session, whether it is for an hour, a day, a week, or more, taking a “learn – review – learn” approach will ensure the neural changes our brains need to develop new long term memories occur and get embedded by spaced repetition. At the very least, when you are learning something you want to retain over months, space out your learning so the content is revisited in some engaging way, especially with some sleep between study sessions. Return to the material at least once within days, at least once within weeks, and at least once within months. Finally, a very effective way to consolidate your learning about AGES is to teach the AGES Model of making learning stick to at least one other person within the next day or so.